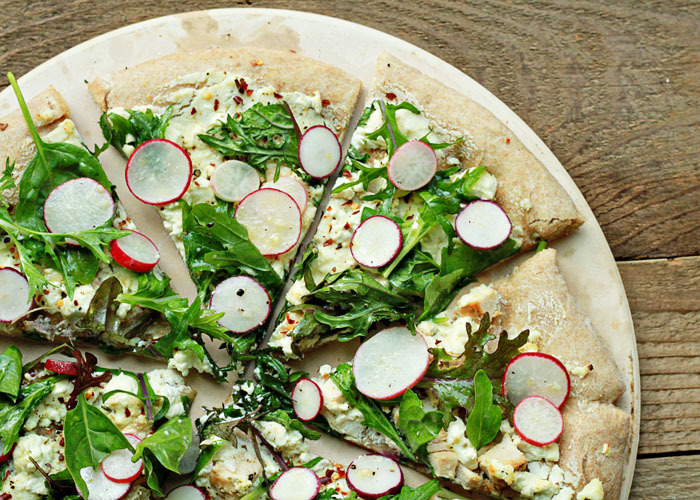 This unique light pizza is perfect for showcasing the freshest late-spring ingredients. The crust gets a slather of ricotta and then a sprinkle of crushed red pepper flakes, crumbled tangy goat cheese, and a little optional cooked chicken. 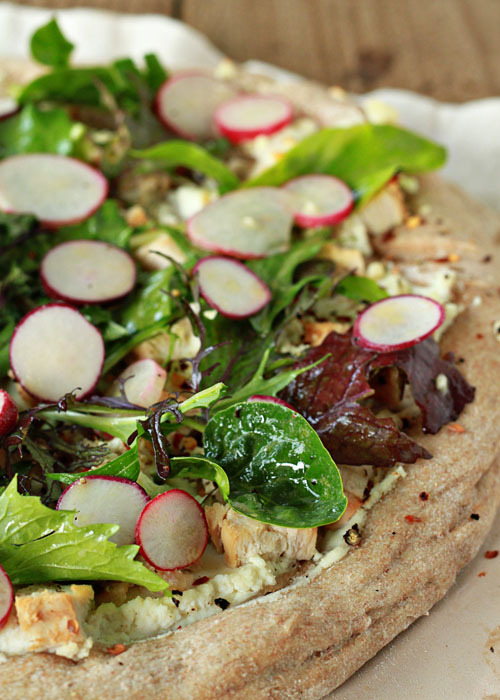 A simple toss of spicy mixed greens and kicky sliced radishes top it off. Last Friday marked the first CSA pick-up of the season – and, well actually, our first CSA pick-up ever. We’ve had boxes of produce delivered to our door in the past, but this is the first true CSA (community-supported agriculture) share we’ve purchased. A few months back, I was waiting for a coffee at Starbucks and found myself toying with the idea of finding a CSA to take part in. I turned around, and there was a Lucky Dove Farm flyer tacked to the wall. Dana is a stay-at-home-mom with a small CSA operation and big dreams. I’m thrilled to be a part of her CSA and I can’t wait to pick up my boxes every week this summer. Fridays are going to be awesome. The first box was on the small side as it’s so early in the season. We received a generous bag of spicy salad mix, a beautiful bunch of radishes, a small bunch of garlic chives, and a sweet arrangement of flowers in a mason jar. In fact, I was so charmed by the bouquet that I didn’t pay enough attention when Dana shared with me what all was included in the greens. I know there were mustard greens in there, but, yeah. Total fail because: a bouquet of flowers! In a mason jar! I’m planning to talk about my CSA treasures – and, of course, share many of the recipes I make with them – all summer long. But the only problem with Friday being a CSA day is that Friday night is also pizza night around here. And so I may have a lot of CSA-inspired pizzas. Like, you know, this one. But I will try to break out of the box – so to speak – more often than not. But meanwhile, you got it: pizza! This pizza strays pretty far from your typical American pizza, but it was so, so good. 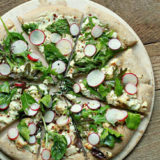 The flavors are nicely balanced, none overshadowing the other – even with the heat of the spicy mystery greens, the snappy radishes, and the generous sprinkle of crushed red pepper flakes. The ricotta base was absolutely perfect for showcasing the wonderful fresh veggies. I adapted the recipe from Cooking Light’s version which features arugula and, well, overall far less cheese. You know me. I had to use more cheese. So here’s how it went. I got home with my goods, placed my CSA flowers at the center of the picnic table, smiled, and went back inside to stretch my pizza dough. I placed it on a pizza stone (a cookie sheet works fine too), and then I smeared ricotta on the crust (an incredibly easy store-bought Trader Joe’s whole wheat dough). Then I sprinkled it with a little salt, freshly ground black pepper, and red pepper flakes. Then I sprinkled some cooked chicken on half for my carnivorous guy, and crumbled a good amount of soft, tangy goat cheese over the top of the whole thing. (If you’re a vegetarian and the idea of meat so close to your vegetarian half makes you queasy, just make two smaller pizzas). While the pizza was cooking, I tossed the greens and radishes with a nice garlicky vinaigrette, then I pulled the piping hot pizza out of the oven and layed the veggies right on top of that bad boy. 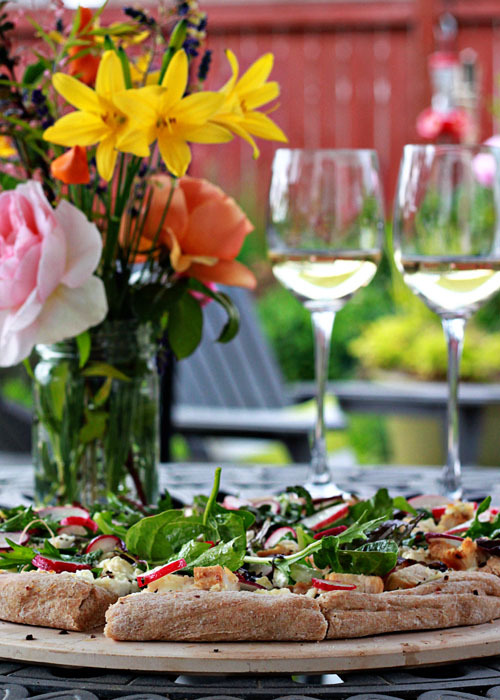 Oh, and I poured a couple of glasses of a beautiful local Riesling – not too sweet, just perfect – then I rolled the wheel through the pizza (veggie side first) and then, being a blogger and all, I quickly photographed it. And then we ate it. And life was good. The end. Well, the end of that meal. BUT! The very beginning of CSA season. Hooray! In a small bowl or jar, whisk together the olive oil, vinegar, Dijon mustard, garlic, and salt and pepper. Taste and add additional salt and pepper if you wish. Pull/press/roll pizza dough into an approximately 14-inch circle. Sprinkle a little flour on your baking surface (stone or baking sheet) and carefully transfer the dough. Spoon the ricotta onto the dough and gently spread with a spoon, leaving 1/2-inch border around the edge of the pizza. Sprinkle the ricotta with the crushed red pepper flakes, a generous pinch of coarse salt, and the freshly ground pepper. Crumble the goat cheese and evenly sprinkle it over the top. If adding chicken, spread it onto half or all. Bake for 10 – 12 minutes until the crust is golden brown and cooked through. Meanwhile, add the mixed greens and radishes to a large bowl. Pour the vinaigrette over the top and toss. 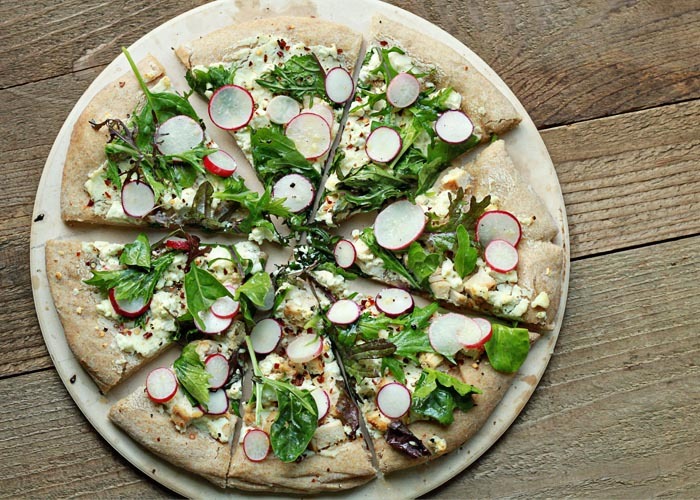 Remove the pizza from the oven and immediately top with the greens and radishes. Slice and serve. Pass grated Parmesan for topping, if desired. 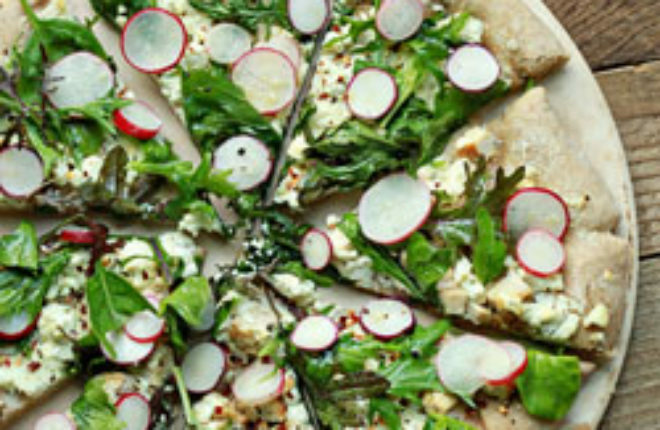 Any spring green mix will work with this pizza, but the occasional baby mustard green and/or peppery arugula will add a welcome little kick. This looks so pretty! i love the idea of adding of the radishes! great minds think alike! we just made a pizza very similar to this last night. Absolutely delicious!!! We also enjoyed a couple of glasses of Rose’ Bring on summertime! This looks incredible!!! Totally my kind of pizza. Love ricotta and goat cheese. Mmm! And radishes. And arugula! *drools* I’m definitely making this this weekend. We receive our first grass fed chicken from our CSA next week- we are normally vegetarians so aren’t sure what to do with it! What is your favorite chicken recipe?